* Chinese spy chip in US servers? * Is North Korea hacking US ATMs? Zack describes recent discussions of the new Linux kernel Code of Conduct. Bodhi is a lightweight Linux that features Moksha – a simple but colorful desktop based on Enlightenment 17. Several Live distributions support anonymous surfing on the Internet. Heads is a leading alternative that even lets you surf secretly on older hardware. Nitrux Linux integrates a flexible new package tool, an easy-to-use encryption system, and other useful innovations. By isolating complete work environments in virtual machines, Qubes OS offers a significant security boost. We look at the Purism Librem 15, a new Linux laptop with the emphasis on security. Software projects often comprise several code†branches, some of which exist in parallel. Git supports community code development through remote repositories and code branching. The Linux /proc virtual filesystem offers a window into a running system; look inside for information on processes and kernel activity. Contrary to conventional wisdom, a command-line presentation app can be easy to use. When you really need documentation, it's almost always incomplete or outdated. Charly recommends a different approach: the universal community documentation tool cheat.sh. Pretty much any computer science lecture about graph theory covers the "Seven Bridges of Königsberg" problem. Mike Schilli puts a Python script to work on a solution. Communicate with your littleBits sensors and devices through Python programs. Upribox 2.0 acts as a router and filters both trackers and ads, saving you the annoying task of manually hardening your web browser with countless add-ons. An open hardware laptop that encourages hacking and repair while offering security and transparency – all for an affordable price. 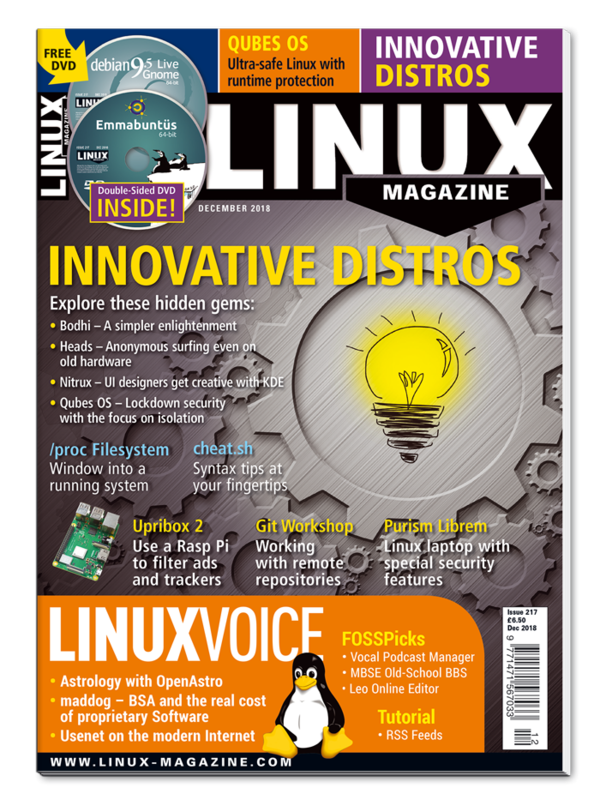 Welcome: This month in Linux Voice. Published rates of "pirated" software show how much most countries lose with proprietary licensing. Determine the positions of stars and generate charts to use when creating horoscopes. Before the web as we know it existed, Usenet performed the same tasks now done by web forums and social networks. Synth-nut Graham pulls himself away from Moog One hype to unveil the best free software released this month. Your news feed notifications don't have to be distracting or intrusive.